Part one of a four part series, in which a new game about an avocado and a young inventor sketches out new ideas for both television and videogames. Google’s Stadia does likewise. Apple’s Arcade and Netflix’s Bandersnatch do not. This is part one, looking at mobile interactions and lean-in, lean-out. Part two unpicks the broader context of platforms and formats. Part three explores the new grammar of television and games. Part four summarises an optimistic narrative for tech and format invention. Created by Playdeo, whose founders include alumni of the influential design firm BERG, Avo hovers between game and TV show without ever quite settling on either. It’s more interesting as a result. I won’t dwell on describing the game itself here: you can read a review for that, describing Avo, Billie and their adventures, or watch the introductory playthrough below. Instead, I’ll concentrate on what Avo suggests might be emerging from this hybrid of videogame, internet and TV show as format, as the three most influential media of our time, and on the single most influential device of our time, the mobile phone. Following a fortnight (no pun intended) later, Google’s Stadia also promises an entirely new experience of gaming, also predicated on the internet and its attendant devices. A week after that, ever the follower, Apple launches Arcade, a videogame subscription service and platform for iOS, and mentions it will be investing in videogame development, alongside its Netflix/Amazon Prime-like investment in TV shows. From this single, small-ish game, deceptively simple in its positioning, to the multi-billion-dollar platform plays of these two behemoths, that is a lot of announcement for a few weeks. An avocado can be too young to reveal its latent promise, just as a tech giant’s platform play can appear perfectly ripe, yet fall apart under the knife. In other words, these announcements are too recent to make much real sense of them. Still, let’s give the thing a squeeze. There seem to be several things going on here. The first is that Avo describes a uniquely optimistic and inventive approach to interaction with media, to characterisation of code, to spatial environments for visual narrative, to a new grammar of interactive film language, and so to the fusing of videogames and TV shows into some new hybrid. Secondly, it is in new forms of media and new platform formats that TV is being reinvented – rather than in the content of the shows themselves, as strong as the latter may be. That, in turn, provides a touchscreen sheen for the old idea that form itself has substance, has meaning. As well as Avo, Google’s Stadia seems to understand this, and it’s suggestive of new experiences and interactions accordingly. Apple’s Arcade, and its TV+ platform, does not, instead paddling in the calmer waters of investing in traditional storytelling consumed in traditional ways. People have talked about mobile-first, as a directive for ensuring that digital products work well on phones primarily, for about a decade. Yet Avo is not simply mobile-first, but so inherently, fundamentally mobile-only that it can only be envisaged as a shimmering story glowing within a phone’s display, could only be interacted with via the phone’s touchscreen in its most intrinsic manner, could only portray its narrative universe via a phone-scale portal, could only take advantage of the social halo of several players standing around a phone in the manner of teenagers on street corners, and we could only assume correctly that it would take advantage of the surfaces around a phone-based augmented reality. As opposed to fixed visual experiences — TV sets, games consoles, cinema — in which you, the viewer, is pinned within a fixed umbra of validated viewpoints, or enclosed immersive experiences — VR headsets or HoloLens — where the viewer is largely removed from the world around them, the phone is, as the name suggests, mobile, and Avo, as a mobile game-or-is-it-TV-show, has it both ways, playing with multiple viewpoints, frames, interaction types, social relationships and spatial logics that are inherently phone-y. This is not porting a TV show like Eastenders to a phone, with the latter a supplicant of the former medium. Nor is it a videogame of Spiderman, say, a playable narrative universe defined by the logic of film. Nor is it a film like Tomb Raider in reverse. Nor is it a TV show taking advantage of mobile voting, like X Factor, essentially a data processing upgrade for a basic interaction familiar to viewers of Multicoloured Swap Shop, decades ago. As Playdeo’s Jack Schulze suggests, those things are not truly native to their medium, but awkward half-steps. Avo is native. Avo “speaks to an audience for whom the phone is their first — and for some, only — screen” says Schulze. Through its particular choices about interaction, about framing, about projection, about game design, Avo is uniquely and artfully defined, with almost complete confidence, for the phone alone. It takes advantage of the most successful and influential product of our time in ways that feel optimistic, progressive, inventive, and playful simultaneously. We will get to Netflix’s much-hyped allegedly interactive Bandersnatch later. Yet Avo is the one to watch, as a far better-balanced hybrid of videogame and TV show. It is more ambitious, as a form. It makes Bandersnatch’s ‘Choose Your Own Adventure’ format look like, well, a ‘Choose Your Own Adventure’ format. In other words, hardly compelling once we had invented videogames, as those of us who grew up with both will recall. This direct manipulation, this “television you can touch”, again reveals this attempt to make something innately of its medium, or in fact, a new medium which is a hybrid of videogame and TV on phone. You can also see this in the hugely successful game Monument Valley, by UsTwo, and in the legions of ‘twitch’ games out there — in each, you touch the pixels directly to control. You can’t imagine using a Playstation controller, or keyboard, to control Ida in Monument Valley, or Avo. Remember when the iPhone came out, and we all marveled that our three year-olds needed no instruction manual to learn to swipe and pinch … these games are predicated on that innate, inherent and unique interaction mode: the direct physical interaction of touch. This unlocks what we call lean-in, as opposed to the traditional lean-back mode of television or film. In fact, it is almost be in, as if fingertips and pixels merge, well beyond even the extreme lean-ins of your average highly engaging video game. Whether NBA or Battlefield, you are leaning in, far more so than with traditional television. Yet in touching the pixels, as you do in Avo, you are all but part of the screen itself. Avo actually has a delightful rhythm in this sense, balancing the lean-in of direct interation with the lean-out of short cut-scenes. Given this form of interaction, it feels no accident that games like Monument Valley and Avo are the product of interaction design studios, rather than traditional television production companies or even videogame studios. In this, Avo, along with a few other recent developments, is inherently sketching out a new visual language for games and TV. Marshall McLuhan (in)famously wrote about how new media would emerge by emulating the old, before the old media would adopt the tropes of the new, in a kind of call-and-response relationship, before both found their own unique, complementary paths, each altered and developed by the interactions, some fizzling out, most adapting. The first TV shows essentially placed a camera in front of a radio presenter, before finding their own uniquely televisual formats, just as early cinema would film theatre productions, and Pong would in some way ape table tennis. Yet each format, or medium, finds their own new voice eventually, after a kind of evolution by dialogue. Avo feels like a new kind of TV, unfurling under your fingers as much as in front of your eyes. Form is interesting to me, as a designer, and I suspect this is fundamentally interesting to Playdeo’s creators too, who are also designers, artists, filmmakers, and coders as much as they are TV producers — in other words, also likely to be obsessed with format, structure, medium, platform. Design brings form to ideas, makes form from ideas, generates ideas through form-making, is thinking through doing and making. This would make designers a particular kind of storyteller. James’s quote suggests that invention in form is just as substantial as narrative invention, if not more so. Although James, writing at the beginning of the 20th century, could not have seen the explosion of format that would unfold in the next 100 years, he might well have been reflecting on the impact of the novel itself, rather than particular works within that format. 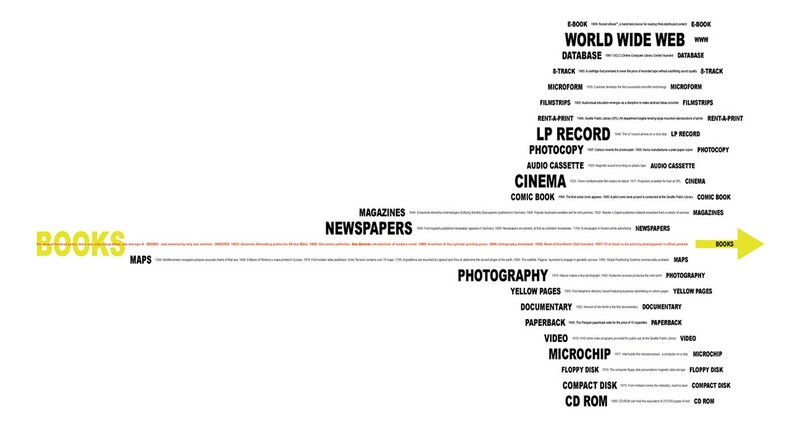 When working with on strategic projects with libraries, I often show Bruce Mau’s diagram, produced during his studio’s collaboration with OMA on their Seattle Public Library project, to demonstrate this expansive evolution in medium that occurred just after James’s writing. Over 15 years on, the diagram above needs updating to illustrate the sheer weight of invention predicated on that single line WORLD WIDE WEB, but also because the videogame and TV show — as narrative forms existing on, then, video, CD ROM, web, floppy disk — do not really feature in themselves. Yet these two are perhaps the dominant narrative forms of our time. And Avo appears to believe in the formats itself. It is positive about the forms of both television and video games. This was part one, looking at mobile interactions, lean-in, lean-out and form. Next, part two, unpicking the broader context of platforms and formats. Part three explores the new grammar of television and games. Finally, part four summarises an optimistic narrative for tech and format invention.